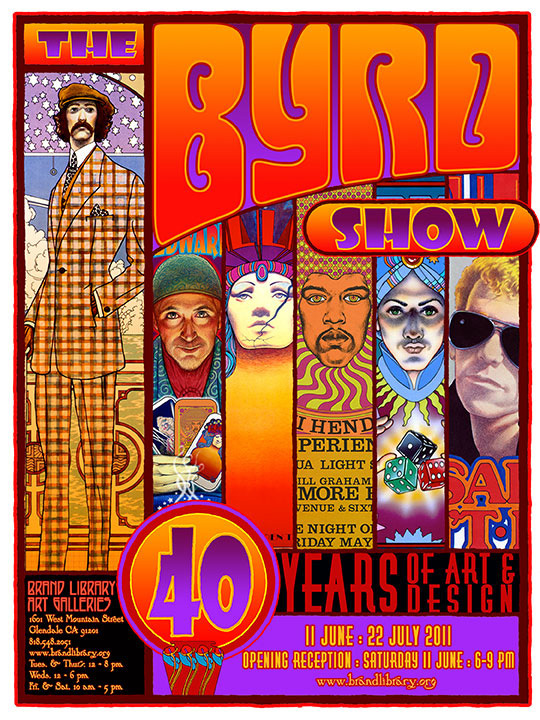 The Brand Library Art Galleries is proud to present The Byrd Show: 40 Years of Art & Design, the first West Coast retrospective of renowned artist and graphic designer David Edward Byrd‘s career. The Rolling Stones. The Grateful Dead. Jimi Hendrix. Jefferson Airplane. Stephen Sondheim. Stephen Schwartz. Alan Menken, Andrew Lloyd Webber. These are just a selection of the rock ‘n roll and musical theater greats that David Byrd has worked with over the years. With a career spanning more than four decades, David’s work is firmly entrenched as part of our visual culture. Who does not recognize the famous “Follies” poster (the original is owned by The Smithsonian), or the Jimi Hendrix Experience poster, ranked by Billboard as the 8th best rock concert poster of all time! David is a master of technique and employs many media to create his eclectic work, including watercolor, pencil and colored pencil, acrylics, ink, transparent dyes, graphite, chalk, airbrush and collage. Though he makes use of digital tools, happily replacing tedious processes like Letrafilm color transfer, he always starts his work by hand. Detailed, lush, and expressive, his output includes posters, book, magazine and album covers— he received a Grammy Award for album design along with several other prominent illustrators for The Who’s rock opera Tommy. A poster designed by David for the exhibition will also be produced and available to the public. For more about the artist David Edward Byrd visit his website. “Byrd Songs”. Musical direction by Daniel Faltus. Saturday, July 16, 7 pm. Leading Los Angeles vocalists celebrate musical theater masterpieces by way of the Byrd posters. The Byrd Show A visual talk by artist David Byrd with anecdotal commentaries on his work. Saturday, June 25, 3 pm. A visual talk by artist David Byrd on the history of the poster. Saturday, July 9, 3 pm. David Edward Byrd earned a BFA in painting and design and an MFA in painting and printmaking from the Carnegie Institute of Technology in Pittsburgh (now Carnegie-Mellon University). Post-graduation, David co-founded with Peter Nevard (another Carnegie graduate) the multi-media artists collective Fantasy Unlimited on a 110 acre farm in New York. David’s career as an illustrator took off in 1967 when he began working for Bill Graham, the rock ‘n roll impresario and concert promoter. Busy designing posters for the Fillmore East, David began creating for shows both on and off Broadway. In 1971 David’s first exhibition at the Triton Gallery for International Theatre Posters was a huge success. From 1971 to 1979 David taught illustration, life drawing, and airbrush technique at Pratt Institute and The School of Visual Arts in New York. David may be one of the few people who can say that the band Van Halen changed their life; in 1981 he moved to Los Angeles to create the book and ancillary graphics for their Fair Warning Tour, thus launching his West Coast career. In 1984 David became the art director of The Advocate, a periodical devoted to gay and lesbian issues. In three years he transformed it from a tabloid newspaper to the standard glossy magazine format that we know today. Two of David’s more notable freelance projects during these years include fifteen book covers for Dorothy Sayers’ Lord Peter Wimsey mysteries for Hearst Publications and all the design and drawings for The New York Times Manhattan Coloring Book with text by Pulitzer-Prize winning architectural critic Paul Goldberger. David’s concept for the mystery novels was to create genre set piece paintings that cleverly include clues to the plot, all with the appropriate Edwardian veneer. These paintings are remarkable for their beauty, attention to detail and accurate depiction of Edwardian interiors. In 1991 David was hired as Senior Illustrator at Warner Bros. Studio newly formed Consumer Products division. In this role he lead a large department of artists who created illustrations, backgrounds and style guides for all the Looney Tunes & Hanna-Barbera characters, as well as posters and style guides for Warner Bros. feature films. David says that “being [at Warner Bros.] was the most intense art experience I ever had: for 11 years it seemed that I never stopped drawing and painting except to eat and sleep.” His last three years at Warner Bros. he spent working on the Harry Potter style guides, for which he did hundreds of drawings of everything from Diagon Alley to the Hippogriff. Since leaving Warner Bros. in 2002, David has continued to freelance and enjoys life in Los Angeles and his personal and professional partnership with artist Jolino Beserra.